Let’s say you are at working in front of your computer. You have something you need to quickly write down. Do you use a sticky note or a digital file? Ten years ago I used to jot quick things down on sticky notes or a paper notepad. But now I jot things down into a text file on my computer. 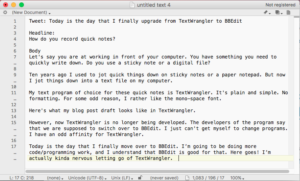 How my blog post draft looks in TextWrangler. 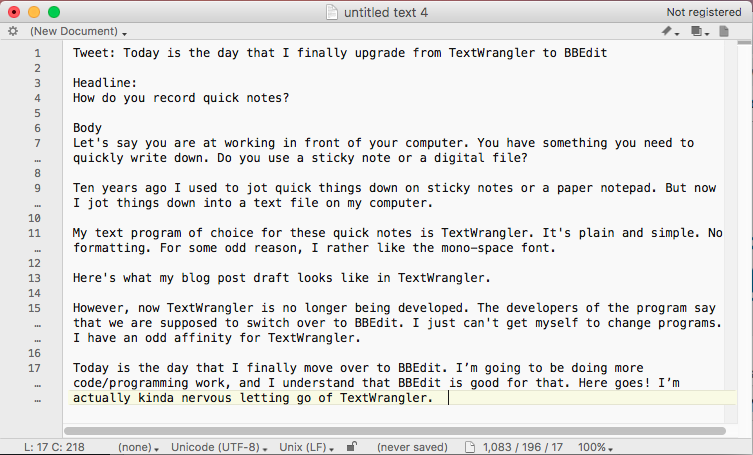 My text program of choice for these quick notes is TextWrangler. It’s plain and simple. No formatting. For some odd reason, I rather like the mono-space font. However, now TextWrangler is no longer being developed. The developers of the program say that we are supposed to switch over to BBEdit. I just can’t get myself to change programs. I have an odd affinity for TextWrangler. Simplenote is free?! I’ll give it a try. For the last 20+ years I’ve been using Apple’s TextEdit (formerly SimpleText). cmd-shift-t puts it into my preferred mode, plain text, an extremely minimal interface which can be tucked into the corner of screen saving tons or real estate. Super efficient. I also love that plain text mode strips out all the formatting and uses monospace text. Sounds like you use TextEdit for all the reasons that I use TextWrangler. Let’s say you quit the program without saving your document. When you reopen TextEdit, does it automatically reopen your unsaved text document? TextWrangler does that. I love it.